A recent report published by the DFID-funded BRACED program draws on Blumont’s RIC4REC in exploring effective processes for building community resilience in an absorptive, anticipatory and adaptive way. Scaling and embedding efforts into ongoing government processes. 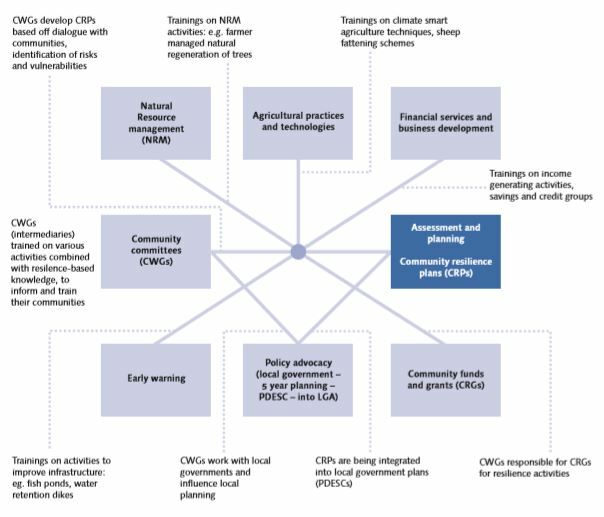 RIC4REC was shown to incorporate all of these processes in its programming, which focuses on building the community resiliency of 264,000 people most vulnerable to the risks of climate disasters in Mali. The report stresses the importance of nuanced work that reaches communities in a way that meshes with individual needs, and mentions RIC4REC several times as an example of integrated and innovative programming. Concerning the “layering and linking” process, the report emphasizes RIC4REC’s approach to community intervention, which involves multiple actors in delivering program activities and helps ensure support from the wider community. This, in turn, makes long-term successes more feasible. The report also highlights RIC4REC’s inclusion process, specifically the program’s initiative to address gender inequality and raise awareness of gender-based stereotypes and inequalities with project staff. The program also adopted an effective, less direct approach to work with both men and women beneficiaries to collaboratively design inclusive approaches. RIC4REC also took measures to respond and adapt to evolving situations and small-scale stresses. The program implemented activities and new groups to support the community during unexpected turmoil, continuously intervened in community activities to ensure all projects were community-driven, and organized with other BRACED implementation partners to provide trainings on gender development and the Mali Agricultural Land Use Policy. These initiatives helped support the change process in overcoming social norms and power structures, and helped the community interact with local authorities. Finally, RIC4REC’s work on scaling and embedding its efforts into ongoing government processes has shown extensive integration of community efforts and government and institutional approaches to climate resiliency. RIC4REC has, at the community and institutional level, provided awareness and skills trainings, incentivized replicating activities in non-project areas, worked with mayors to scale out activities across their local government authority, facilitated community involvement in government planning and budgeting, and made long-term mobile climate services available through the Orange mobile network in Mali. RIC4REC’s Community Working Groups (CWGs) have also demonstrated how the program can grow to non-project areas. Working together to exchange knowledge with each other, as well as with non-program participants, the CWGs have increased RIC4REC’s visibility and extends its efforts to the wider community.